How quickly will electrification and automation take hold in the sector? 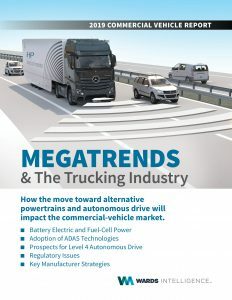 This report examines how the megatrends of electrification and automated-driving technology will impact the medium-and heavy-duty commercial-vehicle market. Author Jim Mele has spent decades covering the medium-and heavy-duty truck market and developing contacts within the industry at major manufacturers and fleet operators. He brings that vast experience and knowledge to bear in examining the question of how quickly electrification and automation will take hold in the sector. OEs and Suppliers: Provides outlook for commercializing key technologies in the big-truck sector, competitive insight on the approaches taken by each of the major truck manufacturers and discusses some of the pain points in terms of market adoption. Commercial Fleet Operators: Discusses the cost/benefits of various technologies and in which segments and applications they may make the most near-term sense. Policymakers: Examines the pros and cons of each technology, the infrastructure requirements and the likelihood of market acceptability. Survey: Who Will Be First Adopters? Survey: Has Government Provided Enough Guidance? Order the CV Tech Report Now!